Canadian pop mega-star (and meltdown waiting to happen) Justin Bieber is releasing weekly tracks in the lead-up to his Believe 3D movie on Christmas Day. For the next release in the series, the Biebs is earning himself a little artistic cred by teaming up with buzzed-about Chicago up-and-comer Chance the Rapper. 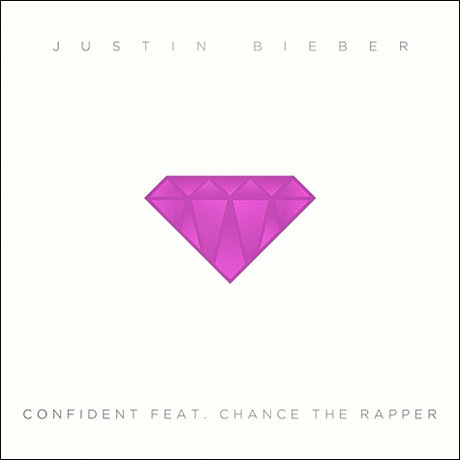 The pair have teamed up on a song called "Confident," which will arrive on iTunes as soon as the clock ticks over to Monday (December 9). That's the single artwork above. Evidently, Chance is a fan of the collaborative song. This past Monday (December 2), Bieber tweeted, "@chancetherapper we are next," to which Chance replied, "@justinbieber it's so damn good." Another tweet from Bieber hinted at further collaborations in the #MusicMondays series. He wrote, "@chancetherapper @BigSean @diplo @LilTunechi @rkelly they have no idea what is coming. #journals." Whether this means that all these stars appear on one song, or if they're spread across a number of songs (or part of an entirely separate project) is anyone's guess. This isn't the first time that Bieber has teamed up with critically adored hip-hop stars; his records have featured cameos Drake, Kanye West and Raekwon, and he once made beats with Dr. Dre.